Justin Langer, Australia’s coach, believes that the successful reintegration process of Steve Smith and David Warner during Australia’s ODI series against Pakistan in the UAE gave him the confidence to include the duo for the 2019 World Cup to be held in England. Cricket Australia named their 15-man squad for the defence of the trophy they won on home soil in 2015 and the inclusion of the duo – who have only recently made a return to competitive cricket after serving their one-year ban, was greeted with a mix of curiosity, especially in the backdrop of Smith finding a place ahead of the in form Handscomb. However, Langer believes that his personal interactions with the pair ever since being appointed as the team’s head coach and the successful outcome of the Dubai visit went a long way in assuring him that the duo could fit right back into Australia’s scheme of things. Both Warner and Smith, who are currently involved in the IPL, are expected to join Australia’s World Cup preparation camp, which will start on May 2. The camp also includes three practice games at the Allan Border Field, Brisbane, against a visiting New Zealand team. “We had some big talks about the values and the direction we’re going in,” Langer told SEN Breakfast on Tuesday (April 16th). “It was great to have them there (in Dubai), we had a social night with them the night before and we got a bit more formal with them the next day with the team. “They were part of the discussion about values. They didn’t necessarily get up and speak in front of them, there has been plenty of that going on over the past 12 months. It has been a huge 12-month period of learning for them and us in Australian cricket. It worked well, it was nice to have them over there before we start kicking off the cricket with them,” Langer added. 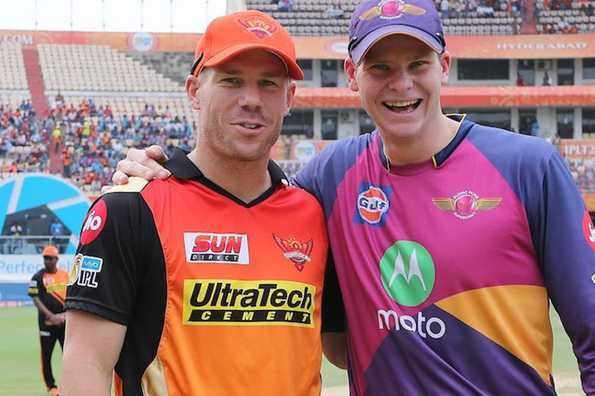 Despite having not played competitive cricket for the best part of a year, Warner and Smith have looked sharp for their respective franchises in the ongoing IPL with the former leading the run-charts amongst batsmen. Their inclusion though leads to confusion in the ranks in a team that has got back to winning ways in the recent couple of months. Led admirably by Aaron Finch, Australia bounced back from 0-2 down to beat India 3-2 in February-March and then proceeded to whitewash Pakistan by a 5-0 margin in the UAE. One of the star performers in Australia’s eight-match winning streak was Handscomb who has now been dropped to make way for Smith, while Usman Khawaja faces anxiety over his opening position with the return of Warner. Langer said that the training camp and the three matches against New Zealand will be utilised to test various opening combinations ahead of the mega tournament. Finch’s men will have further matches against England and Sri Lanka before beginning their title defence against Afghanistan in Bristol on June 1st.